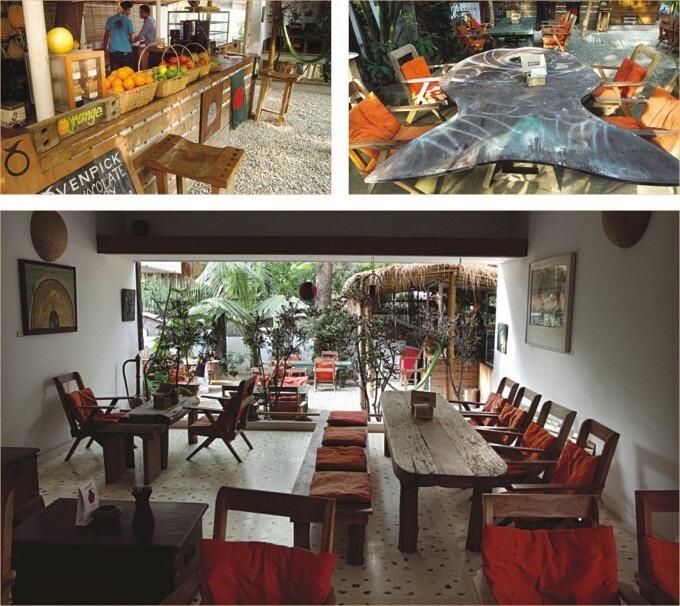 Mermaid Cafe in Dhaka? The brand that was born on the seaside of Cox's Bazaar and exemplifies the laid-back charms of Bangladesh's premier luxury destination, has now moved to a location that is the very antithesis of the country's beautiful, soul-quenching southern coast. The less said about the trials of life in the capital, the better. Suffice to say that it is neither unusual nor pessimistic to entertain grave doubts about whether a brand that has made itself synonymous with the natural beauty of Cox's Bazar can make its place in the harsh concrete jungle of Dhaka. To that end, the owners could hardly have picked a better spot than the city's posh neighbourhood of Baridhara, where the honking of cars and the grime from their exhausts seem distant. House 9 of Road 9 is a plot shrouded in the green of trees lining the boundary. Upon entering and with a little suspension of disbelief, patrons can coax themselves into thinking that they have left the city behind. The decor and ambiance of the place certainly helps. Before one enters the restaurant proper, there are six small screens by the doorway featuring scenes from the original cafe hundreds of kilometres away, just to help people get in the mood. The al fresco seating arrangements in the front yard, complete with a juice and ice cream bar, accomplish much the same purpose. Those familiar with the Mermaid brand and their eco resort near Cox's Bazaar will know that ecological considerations come high on their list of priorities, and measures taken in that regard serve the dual purpose of helping the environment as well as lending a back-to-basics feel, the last of which is needed in large doses in our city existence. A lot of the noble exercise of recycling is in evidence here, but their real success has been in marrying this ideology with the need to maintain a classy atmosphere. Great care has been taken to fashion tables out of drums from seafaring vessels and from logs that have not been cut from live trees but were found lying on the ground. Lamps have been made by puncturing holes in drums and also with the simple yet charming use of dalas (perforated round bamboo trays) placed over bulbs to provide some soft illumination to go with the overall understated decor of the place. But the coup de grace as far as driving home the eco-friendly message and the marine undertones are concerned, are the floorboards taken from dismantled ships. This little bit of imagination is what sets the place apart. The full-fledged restaurant is also a gallery. Numerous paintings adorn the walls with their prices displayed, so that diners can have a look around and do a little art shopping if they so choose. Another highlight is the sun deck on the second floor boasting a sheesha bar, with a sloping straw-thatched roof that really completes the chilled-out 'beach' atmosphere that seems to be the true selling point of this brand. The deck looks out on the front yard with its ample greenery. If the rest of the place does not drive away your anxiety the sun-deck will surely do the job. It is no accident that the food has been left so late in the piece, as almost any Bangladeshi culinary enthusiast will know of the high standards of Mermaid's Cox's Bazaar eatery, and they will be happy to know that those standards have been faithfully adhered to in their Dhaka incarnation. The menu is extensive, taking the best of European Continental cuisine and, as the Cox's Vetki Steak will testify, a taste of Bangladesh as well. The head chef, Naorose bin Ali, who learned his trade in Australia recommends the Red Snapper, Pomfret and Lobster from the seafood section, the Spicy Thai Chicken and Grilled Chicken with Mushroom Sauce for the meat lovers and the Creme Brulee for the dessert junkies. At a glance the menu may seem pricey, but Ali explains that it is because of the high quality they strive to maintain. “All the cheese I use is imported, as well as the virgin olive oil, herbs, Italian tomatoes and steak which comes from Australia. Also, the seafood comes directly from Cox's Bazaar,” explained the chef. A sampling of his work will tell you that the prices are justified, and anyway, it is not just the food, excellent as it is, that you are there for; it is also the experience of being at a beachside restaurant in the middle of a harsh and unforgiving city. You can't put a price on that. For a long time I left my rooftop as it was; scattered with pigeon poop, weeds growing all over the garden patch that was painstakingly filled for planting and scorched strands of long grass. I never thought of doing anything about it. Please don't get me wrong, I love green and have pot plants all over my tiny apartment but the rooftop was always considered too much work. And oh those grain-eating, forever-pooping birds that belonged to my brother; a total menace. They eat everything that is green with a vengeance. This I know because once I did try to grow a garden, but my seasonal flower beds were ravished within 48 hours. And after that I gave up; one futile attempt was reason enough to shelf the gardening business. Now when I look back I would say abandonment of the plan was the easy way out, considering the fact that recently the scenario changed, and thankfully for the better. I went to my aunt's place and on an overcast evening, sipping jasmine tea and sitting in her rooftop garden made me a tad jealous. I realised I was simply being lazy when a little hard work could bring heaven a lot closer to earth. Pleading and begging for a loan from the hubby bank, I got a grant and immediately set off on my new pet project. The victory, which the birds won three years ago, was mine now, in other words you can say I netted it quite well; with one minor regret, why didn't I change my war strategy earlier? Anyway it is no more a missed opportunity. My rooftop garden has begun to take shape. I made an aviary and my problem was sealed with them birds. Now I am enjoying each moment as my fledgling garden is taking shape; the grass carpeting, the seasonal flower beds, the kitchen garden corner, the pot plants and more importantly my belis. Everyday I pick a few flowers, just twos or threes maybe, and place them in a small porcelain bowl on my vanity table, their fragrance impregnates my room making me find that lost happy skip in my steps once again. Every evening when I sit with a good book and my cup of steaming Earl Grey or Orange Pekoe while the ochre sun on the western horizon bids a slow adieu making way for the softer light of stars and the young moon, and a light summer breeze blows away the day's fatigue, I realise what bliss I was missing out on all these years. So the moral of this rambling is that it is good to be a little competitive at times -- at least some pending things get done. And of course, the birds cannot make our lives difficult. QQ Formosa: It is a recent addition to the long drawn menu at restaurants and hangout places frequented by teens and tweens. With their refreshing slushes and bubble teas on the menu, they are attracting quite a crowd. All their slushes are made of fruits and they do not use artificial flavours. Whether it is a strawberry slush or a mango, you will get it no matter which season it is. Fruits are imported, enabling a steady inventory throughout the year. Moreover, they offer additional bubbles (jelly-like balls) which can be added to the slush according to preference. Available within a reasonable price range, these teas and slushes are very much all the rage. G Mask: For personalising and protecting electronic gadgets, one does not have to etch his/her name or buy dull covers to wrap them up any more, thanks to G mask. It is a professional skin wrap service for any electronic gadget like mobile phones, PDAs, MP3 players, digital cameras, bluetooth headsets, digital photo frames, gaming devices, laptops, etc. With numerous designs to choose from, G Masking seems to be the latest trend in customising one's electronic products.